Dundee mixed martial artist Scott Malone is adamant he is destined for the sport's biggest stage, the Ultimate Fighting Championship. The 31-year-old can take a step towards that dream in April when he fights Jack Shore for the prestigious Cage Warriors world bantamweight title in Cardiff. Malone knows inflicting Shore's first defeat could be huge. "This fight could be life changing. UFC is my dream, I genuinely won't stop until I get there," he said. "I'm not going to make up the numbers in the UFC, I will be going there for the belt." Malone is leaving nothing to chance as he prepares for his date with destiny against undefeated Welsh fighter Shore. 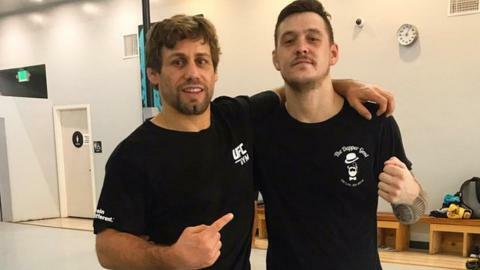 The Scot, who has won six in a row since losing his first professional fight, has just returned from a gruelling three-week training camp at an MMA academy in California. ''Over in Sacramento there is so much talent on the mat. There could be up to 50 guys, maybe 10 UFC fighters, a couple of Bellator fighters or really high-ranked pros ready to step into UFC," he said. "It is a big inspiration, you get humbled when you are sparring with these top-level UFC guys, but I love it." Malone, a former British and Commonwealth judo champion, says juggling MMA requirements with his day job as a scaffolder is challenging. But he is undaunted about venturing into Shore's backyard on April 27 to try to wrest the title from the home favourite, who has a perfect record of 10 wins. "The Scottish are born to fight," he said. "Pretty much all my pro fights have all been away from home. I fought a guy from Doncaster, in Doncaster, and was booed as I was coming out, but I feed off it now."